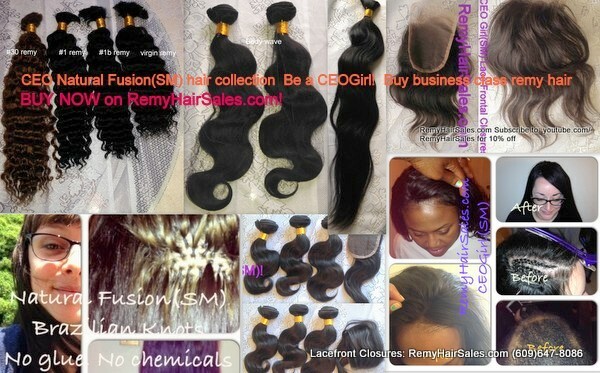 Most popular virgin CEOGirl(SM) hair extensions- RemyHairSales.com. Custom colors or remy hair sales also available. Order more quantities: click on "Add to cart" then change quantity from "1" to 2 or 3 or 4, etc. as needed in shopping cart. Here is a gorgeous CEOGirl(SM) from Michigan (MI) loves her virgin Brazilian remy in curly. Get yours today and be a CEOGirl(SM) too! Get CEOGirl(SM) Business Class hair now! "Here is a picture you asked for of your hair installed. There will also be people calling to order hair because they really liked mine. I hope to send more customers your way." L., Michigan." One of the most popular hair extensions on RemyHairSales.com. California CEOGirls(SM)most popular wavy mixed lengths: 20,22,24". "I just received my order and I am so in love with this hair Thank u Thank u I will be ordering again!" P., California USA. Buy her mixed lengths today! See mixed length 3 bundle deals, and virgin remy deals. RemyHairSales.com: 3 bundle deals virgin unprocessed CEOGirl(SM) wholesale hair sales- we also offer colors or remy hair in the drop down box- simply select and order!